I just noticed that the website for Stephen Colbert’s book Alpha Squad 7: Lady Nocturne: A Tek Jansen Adventure lists me as a top referrer. That means that Hyperliterature forwards enough readers to the Tek Jansen page that they felt obliged to credit me. How cool is that? Colbert occasionally references this book on the show as something that he wrote but can’t seem to get published. It started out as a joke, but the site actually has several chapters available to read. From looking at the Tek Jansen “About” page, it appears Colbert is either a) The actual author of the site; b) Intimately involved with the writing on the page. This means, dear readers, that Colbert could very well be a regular reader of Hyperliterature. I need to calm down”¦my hands are shaking from the very thought. Along with Battlestar Galactica and The Daily Show, The Colbert Report is one of the few programs that I think are important enough to skip bathing to watch. If you’ve never seen The Colbert Report then you’re definitely missing out. Leigh and I had to rewind that interview when it originally aired because we had missed so much of it from laughing so hard. 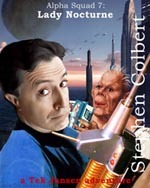 On Wednesday Colbert will air another cartoon inspired by the Tek Janesen adventures. Here is a YouTube list of past cartoons. That only happened because I hit the forward and back button 463,057 times. I hope you appreciate the efforts that I have put forward on your behalf. Oh yeah, Leigh and I might disagree on the whole bathing issue. I do appreciate that. I\’m glad that you have the time to do that for me. Might hell, she agrees with you. I can try to blame it on Ellie, but apparently I have a different smell than she does. Oh, wait. Now I get your comment on the bathing thing. Nevermind. She disagrees with you. I think I was saying that Leigh and i think that you need to bath, my person hygiene not bearing in any way upon this discussion.